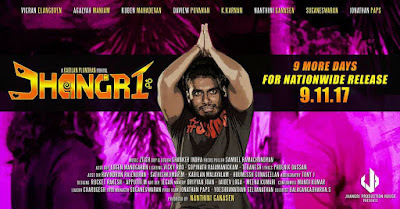 It is great to know that now there is almost one Malaysian Tamil Film being released per month and this month only there is three films being release with the first of it being Jhangri. Here is my review on Jhangri. A fun filled comedy entertainer. This is how the film was heavily promoted and it was evident throughout the film. Before I begin my deep dive into the film’s story and breaking it down, let me give you a simple one liner of the film without ruining the film for you. 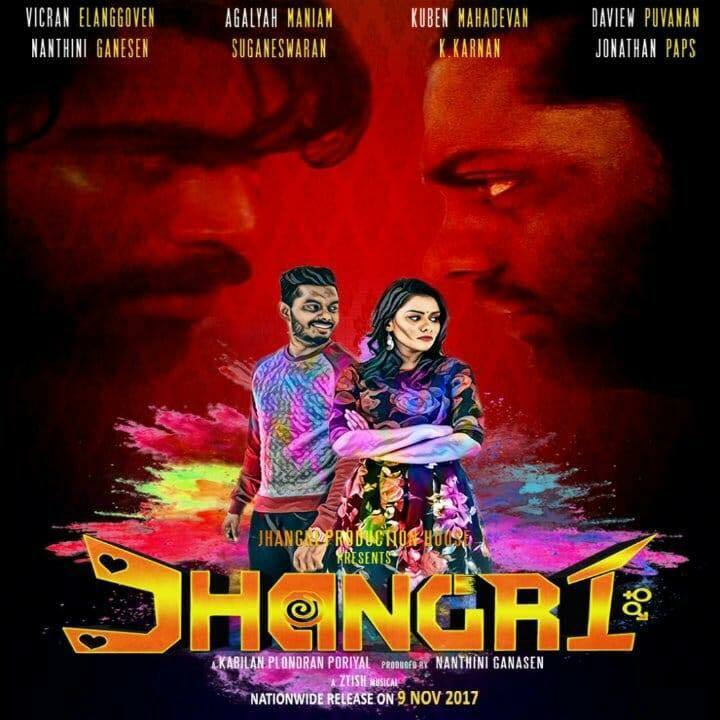 Jhangri is a film about a young man finding love in his life and when his love is rejected, he finds out that it is due to external circumstances and complexity which forces the girl to turn him down. How he tries to solve this and will he win over the girl forms the rest of the film. Yes, this plot line has existed in many Tamil films before this, but what makes this film, different, fresh and engaging is how the amount of humor element that was blend in the film. This is why Jhangri wins big with the audience. They took a simple story and was smart enough to find the right gaps to fill in with comedy portion to keep us entertained throughout the film. Another thing in the story which I enjoyed was how they kept introducing plot twist in the film continuously to keep the film engaging. The first half of the film turns out to be rather predictable but the plot twist of why the heroine rejects the advances of the hero is not something everyone would have been able to pick out at the start of the film. Certainly, I fail to guess it right. The film had about 6 characters to drive the film forward and none of them were there just for the sake having them. The story demanded the presence of these characters in the film in order for them to bring the film to the next portion of the plot. Well done to the team in writing the film in that way. Despite the many positives of the many positives in the film, I would not score the story of the film highly as I felt it was thin and despite the plot twist, several portions of the film felt rather predictable. 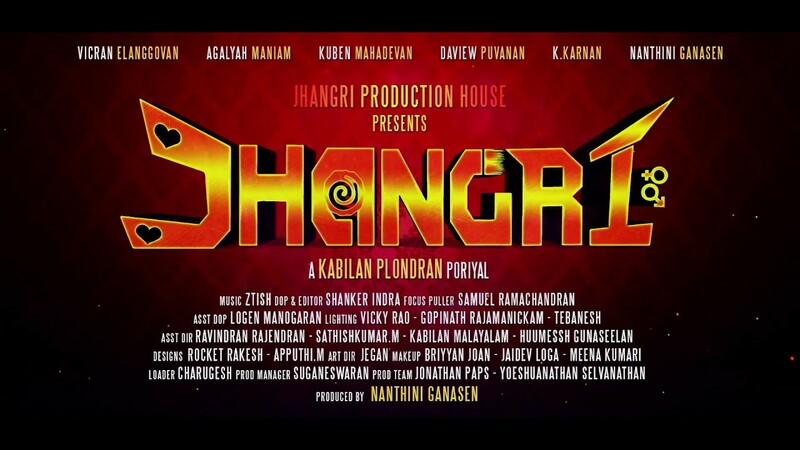 Kabilan Plondran makes his directional debut with Jhangri. 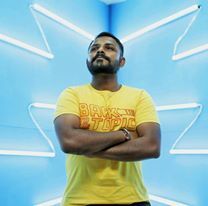 Having previously worked as an AD for Karthick Shamalan in EVT, Kabilan this time takes over the directional seat and brought us this very sweet treat. 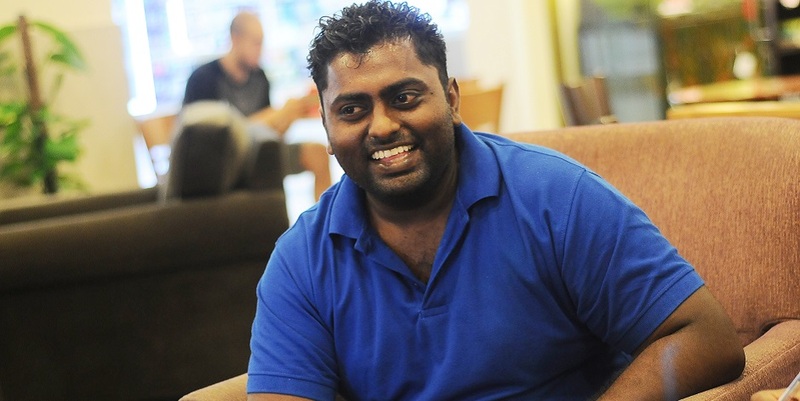 Coming up with a fun filled entertainer for your first film is perhaps one of the best decisions you have made Kabilan. It was very brave of you to write a story which requires 5-6 characters to drive it and yet give them all proper screen time and balance. Well done on that. It was a very neat film as you justified the potential loopholes in the film by having your character to say one of two things and that is very smart. Another part I’ll credit you is on how you avoided flashback scenes and choose to do it through narration. I am personally a fan of when a character narrates a scene of their past rather than showing me flashback footages or scenes. I believe with proper voice narration and good dubbing, you will be able to translate more emotions to the audience compared to a flash back scene. This was evident when Kuben narrates about the little boy and when Agalyah narrates a moment from her past. Thank you Kabilan for choosing this approach. Short, direct and impactful. Personally, I wished you could have avoided a couple of things in the film which I didn’t feel was relevant. For example, I identified two portions in the film where a social messaged was stuff in for the sake of it, which doesn’t balance the scene. I don’t think this film needs a social message, yet you went for those moments. In your effort to make this film a comedy riot, I felt a couple of the comedian scenes not funny and interrupting with the flow and pace of the story. However, I am sure it was only me who felt that because during that scene, the whole cinema was laughing except me. You won with them but not with me. I would also like to use this space here to credit your DOP, Shanker Indra on the fantastic camera work done by him. I don’t think I have seen Klang this beautifully. Excellent work on the camera and loved your drone shots. 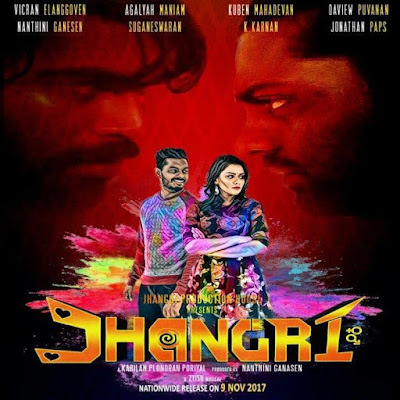 I watched Jhangri with my mother and a small kid. Including that is people from 3 different ages group. Kid, Adult, Senior Adult and all three of us were able to enjoy your film and laugh together. Credit goes to you for coming up with a family that is suitable to be watched by any individual. 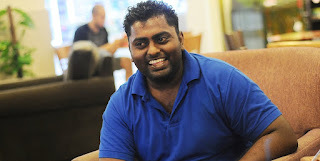 I would say you have joined the elite list of directors like Karthik Shamalan, S.D Puvanendran, Shalini Balasundram and Shanjhey Kumar Perumal who are only a couple of films old and you all are going to be the future of Malaysian Tamil Film Industry. 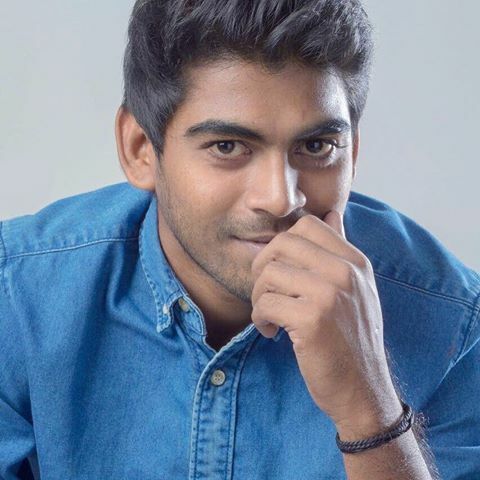 Vicran makes his debut as hero in this film, where previously he played a supporting role in Geethaiyin Raadhai, which was also his film debut. Having watched Jhangri, I am convinced that Vicran is the right pick for this film. The role he plays in Jhangri draws parallel to the role in Geethaiyin Raadhai. I believe that his role here is something like an evolution from the previous role. I felt like it was an extension of his previous role. Vicran did justice to his role throughout the film. He has excellent comical body language and good humor timing which I value very much in a hero. He also aced the dialogue delivery part. Vicran has a nice charm about him where even he is sharing screen space with other actors in the film, he is still able to pull the attention to his performance. It was good to see him make the step up in the industry playing the lead role but at the same time he has so much to learn and sharpen on to be a leading hero in Malaysia. An example of improvement will be the way he emotes when he is crying or being sad. I felt there was plenty of room for improvement, but considering this is his first film as a hero, it is acceptable. He has to work on it and that will push him higher. Vicran needs to add more variety to his emotions and that will bring him places. Agalyah’s rise to stardom is surely an inspirational story everyone out there. Early this year she made her debut in a short feature film called “Venpa”. Then she had an opportunity to be the host of Astro Vizthugal and now she has made her debut in a feature film as a heroine in Jhangri. All of this under a year! Now coming to her performance, I believed Agalyah scored well in her role. She has the looks to be a leading heroine and her acting skills is nothing less. Here she plays the role of Januusree, a corporate working lady who looks always unhappy and disturbed. Her ability to take command in a scene when she is in it should be lauded. She showed good confidence and quality in her scenes and doesn’t seem like someone who is just making her debut. However, where I felt a little let down from her was during the song of “Thooki Erinjittu”. It was a fantastic song and there is a portion in the song with a female voice. 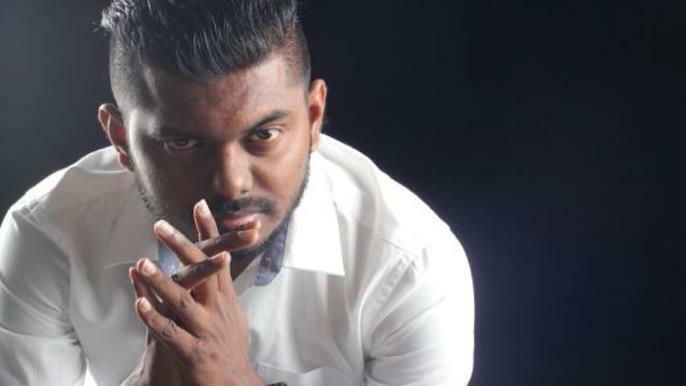 During that portion of the song in the film, Agalyah Maniam’s acting and dubbing was a real let down for me. It didn’t look convincing and it disconnects me from the film a little while. Once again as it is her debut film, she is here to learn and improve and I hope she does because she has all the qualities needed to be a top-quality actress and if she continues to work on the details of her performance, she will make it big at the top. I usually don’t do a separate section for supporting actors in a film but this guy’s performance in the film demanded me to have a separate portion just for him. There is no doubt about his ability to speak in front of camera as you can see from his DaView YouTube channel videos, however acting in a film a whole new ball game and Puvanan had to step up his game. Did he step it up? The answer is a big yes! In a film with so many established cast names, DaView Puvanan was perhaps the unknown one among them to the public. Having watch the film, if the audience is going to speak about anyone, they will speak about it. 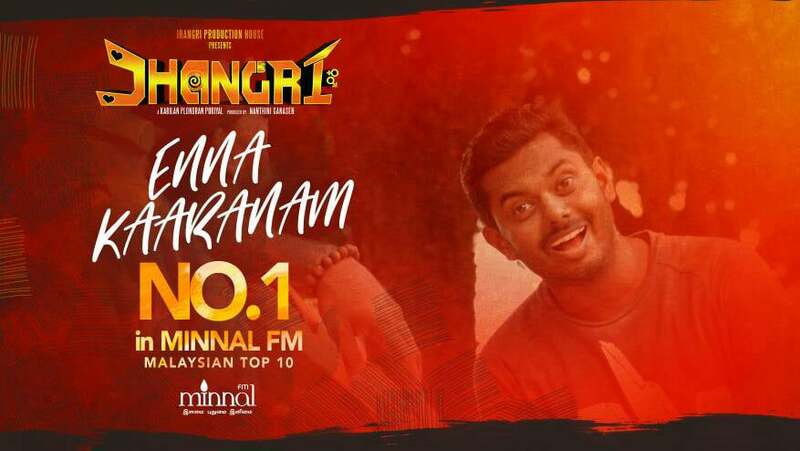 I can’t remember when was the last time I laugh out loud in a Malaysian Tamil Film as most of the previous film comedy felt unnatural and forced, but this boy’s timing and jokes were perfect. One of my favorite scene of the film when Puvanan & Vicran stalks a person, he starts to chant “Garuda, Garuda, Poo Pode” when he becomes nervous. I broke into laughter and claps watching that scene. It was so good. Let be his voice modulation, body language or comical timing, he nailed it in this film. There is still some gaps in his performance which he can work out such as his expressions and dialogue delivery in a more serious scene setting but that wasn’t demanded much from him in this film. I feel he through this film, DaView Puvanan has established himself as the best comedian in the industry. I know it is big words and I hope this spur him to prove me right. These two names were perhaps the biggest and glamorous cast name in the film, yet among the five, it was this two who had the least screen time. Lack of screen time doesn’t mean they didn’t have an impact on the film. In fact, it is these two characters that drives the film in the second half to be honest. First about Kuben Mahadevan, I am at awe with this guy. I loved his performance in this film very much and his voice modulation. He plays a very serious personality role in this film and it is well translated in the film. My favourite scene among many in this film was the portion he narrates a flashback about a small boy. Just take note at how he emotes with his, the way he plays with his voice and dialogue delivery. It sends chills to my spine. Absolutely brilliant from Kuben. I can’t wait for his next film! From being a hero to playing a bit part role in a film isn’t usually the wisest decision an actor should make in his/her career. I must admit that Karnan was brave in making this decision and there is a silver lining in it. The silver lining is that this film allows Karnan to explore a new shade role where he plays a negative role. His talent as a quality actor is for display despite the limited screen time. He utilizes every opportunity he gets on screen and gives a strong performance. It is obvious why he is such a quality actor. I felt he was held back and tied down throughout the film and only at the climax he was freed and allowed to perform in his own zone and comfort and he shows what he has in him. Another good showing from Karnan. 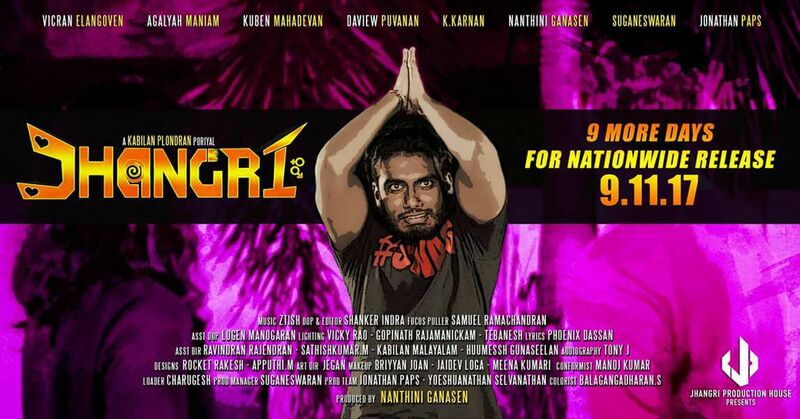 Ztizh hit to fame with Geethaiyin Raadhai with his music and now Jhangri is his second theatrical release. From where he stopped in Geethaiyin Raadhai, he continued in Jhangri. The film has two songs, “Enna Karanam” and Thooki Erinjittu” and they both are chartbusters for me. I loved “Enna Karanam” initially when it was released but over time “Thooki Erinjittu” grew on me and now that my favorite. Take your time to hear both these songs and you will know why. The background score of the film was also on par with those two songs. The music played when Vicran tries to impress Agalyah was soul touching and his background score brings life to many portions in the film. When everything was going good for Ztish, there was one thing which pulls down his rating here. That was because of the theme music/song for Bawan. He tried to do a rap theme song for the Bawan’s character and it came out poorly for me. If that was avoided or a different type of score was put in, he would have scored even highly here. The music for Karnan's role came out very well but not for Bawan.